22/12/2006 / Be the first to comment! / Be the first to like this! 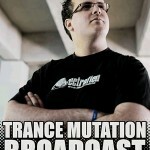 DJ Jonno is back in Trance Mutation Broadcast for another uplifting and banging set with his freshest trance selection! 15/12/2006 / Be the first to comment! / Be the first to like this! Jordan Waeles is back at the decks for an uplifting trance set, one of those that bring you warmth in these cold winter days. 08/12/2006 / Be the first to comment! / Be the first to like this!